TBC Transite Barrier Compound is specifically blended to seal exterior asbestos containing Industrial Fiber Cement Board (Transite®). TBC uses a high-solids blend of resins that forms a hard yet flexible finish that is ultraviolet resistant and mildew resistant. Complies with all federal and state VOC requirements. Use a vacuum with a HEPA filter specifically designed to capture hazardous dust and waste. Use MSHA/NIOSH approved or equivalent respiratory protection suitable for concentrations and types of air contaminants encountered. 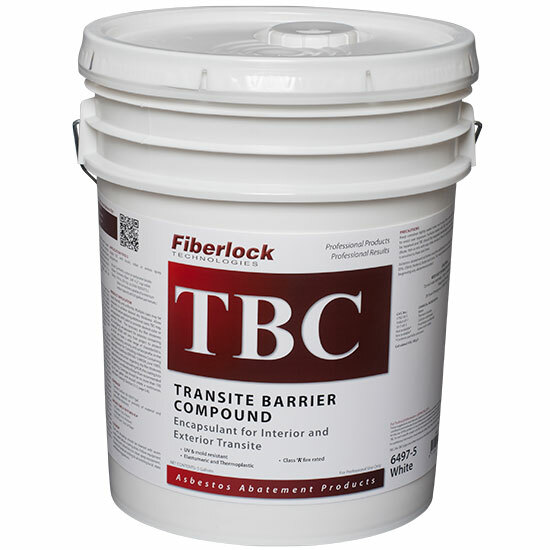 All Transite substrates must be primed with one of Fiberlock’s surface conditioners prior to applying TBC. For detailed and specific information regarding surface preparation, refer to the TBC specification. TBC must be applied when the atmosphere and surface temperatures are above 50°F. Do not apply when rain is imminent within three hours after last application. Inspect all surfaces to be treated to insure they are clean, dry and free of all foreign matter including: dust, rust, grease, oil, mildew, loose paint, etc. If Transite is aged and friable, use a liquid applied surface adhesive such as Grip-Tack to yield a dimensionally stable surface prior to application of TBC. Mix thoroughly, clear liquid present when container is opened is an integral part of the product and must be mixed in completely. Apply TBC with brush, roller or airless spray equipment. Apply liberally and uniformly. Multiple coats may be necessary to achieve desired dry thickness. Allow TBC to dry before applying additional coats. TBC may be top coated with paint to provide desired color or aesthetic finish. The necessary dry film thickness of a bridging encapsulant for asbestos containing materials (ACM) will vary from project to project as ACM can have a wide range of characteristics, including density, porosity, and surface profile. In the EPA’s Guidance for Controlling Asbestos-Containing Materials in Buildings (EPA 560 / 5-84024, June 1985), the primary instruction regarding dry film thickness states that when encapsulating ACM, the coating is to be applied “considerably thicker than recommended for painting. Coverage should be no more than 100 sq. ft. per gallon and should create a continuous, unbroken coating” (Section 5.1.3, page 5-8). Tools and drippings should be cleaned with warm soapy water before coating dries. Follow equipment manufacturer’s directions to clean spray equipment. Dispose of waste according to all existing local, state and federal regulations. Store in a dry place at temperatures between 40°F (4.5°C) and 90°F (32°C). Close container after each use; keep container tightly sealed when not in use. When applying with a sprayer, wear a NIOSH approved respirator with any R, P, N or HE filter. Use adequate ventilation to avoid over exposure. Surfaces coated with TBC must be inspected routinely. Damaged surfaces should be repaired and TBC should be reapplied immediately to prevent exposure to the asbestos hazard. Do not dilute, thin or mix with any other product. Store in a dry place at temperatures between 50°F and 80°F. TBC is sensitive to heat and time. Asbestos abatement activities must be performed in accordance with all applicable regulations including EPA, OSHA, federal, state and local. For more information always contact the appropriate agencies prior to beginning any abatement project.